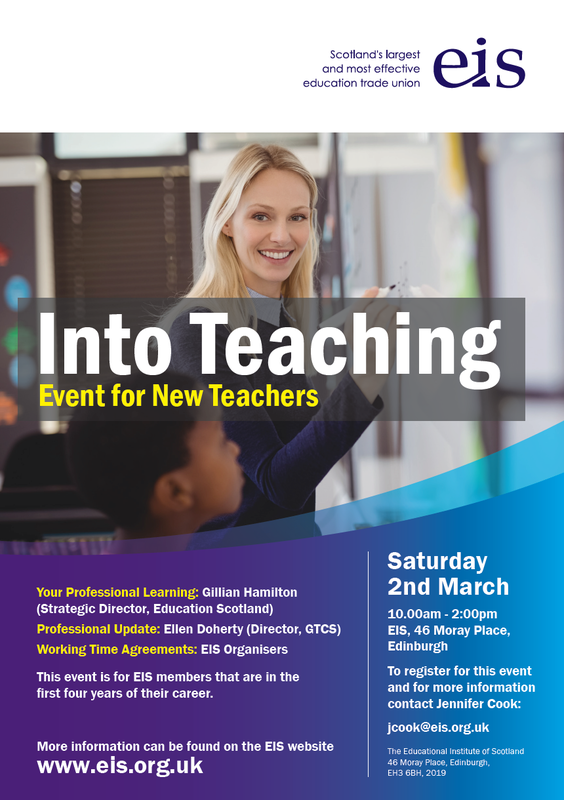 The EIS is holding an event for teachers who are in their first four years or so of teaching. If you would like the opportunity to hear from speakers from Education Scotland, GTCS and the EIS, and to network with EIS colleagues from around Scotland then this event will be of interest to you. Our union strives to provide a range of professional learning opportunities relevant to all members and at all stages of your teaching career. This INTO Teaching Event will cover ‘Your Professional Learning’ with Gillian Hamilton (Strategic Director, Education Scotland) and ‘Professional Update’ with Ellen Doherty (Director, GTCS). Information on ‘Working Time Agreements’ from EIS speakers as well as how to get more involved with the EIS as your union will also be covered. The deadline for registration is Monday 25th Feb 2019.